Bass in your face Switzerland! 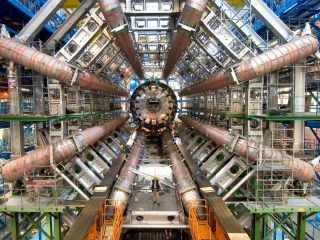 A bunch of Atlas Physicists working on the Large Hadron Collider have come up with a pop song which they hope will beat the X Factor to the number one spot at Christmas. Last year's X Factor champion Joe Mcelddery was pipped at the post by Rage Against The Machine and the Atlas band are hoping that it will be able to do the same with whoever wins (obviously Wagner). According to the band, they have actually "created a double album of original material and covers, crossing all styles of music from rock to classical, that looks set to prove a big hit with both the scientific community and the wider public." The song going to be released is called 'Resonance'. Now, don't get us wrong, the song isn't bad and the scientists on it are pretty accomplished musicians, but a little bit of research (a quick Google search) shows that there is already a better track about the LHC out there. Called the 'Large Hadron Rap', it is a wholly more enjoyable record with the immortal line: "The LHC accelerates the protons and the lead, and the things that it discovers will rock you in the head". Resonance has a UK release date of 6 December which is apparently 13.7 billion years to the day, since the Big Bang. Proceeds from the sales of Resonance will go to the 'Happy Children's Home' in Pokhara, Nepal to help them build an orphanage.